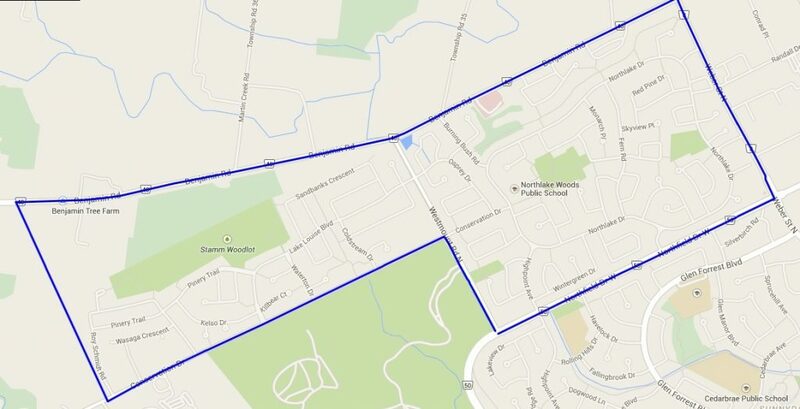 Lakeshore North & Conservation Meadows are two nice suburban Waterloo neighbourhoods located side by side. Conservation Meadows (to the west) butts up against Lakeshore North but is actually a part of the Laurelwood neighbourhood. This is a quiet area south of the famous Farmers’ Market just to the north of Northfield Drive and Laurel Creek. Most of the two neighbourhoods are of similar age at around 25 years but the western portion of Conservation Meadows is very new with some homes still under construction. These newer properties are generally more impressive and less affordable overall. The northern portion of Lakeshore North offers some very impressive homes as well albeit not quite as new. The higher end homes in both neighbourhoods often back onto expansive woodlots. There is one school in the immediate neighbourhood but numerous other schools are very close by. This area is ideal if you want peace and quiet near nature. The Farmers Market is within walking distance as is Laurel Creek Conservation Area, a true Waterloo gem. There’s lots of choice for groceries and commuting is a breeze with the LRT and expressway just a short hop away.